Ojai Pixie Tangerines are these little gems that only come around once a year. 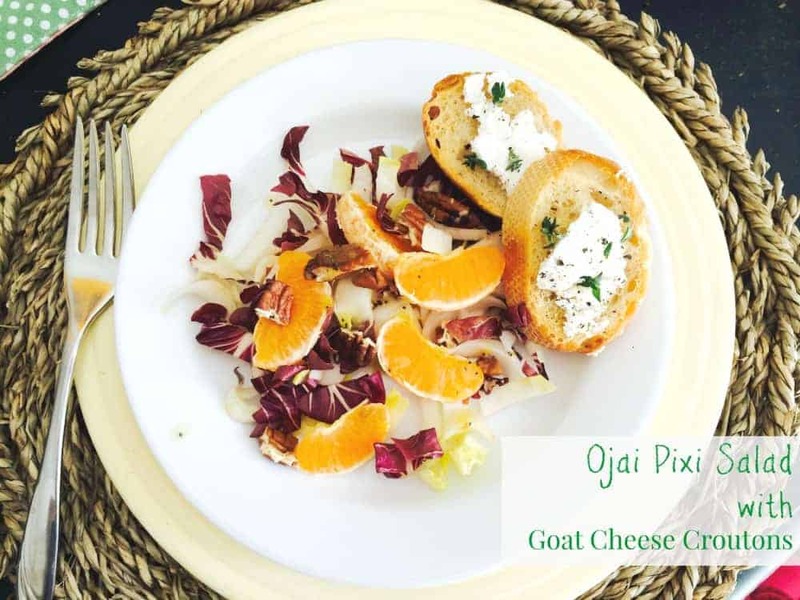 This Pixie Tangerine salad is simple to highlight their sweet tart flavor. It is light and perfect for celebrating spring. They are only around from March to May. These little gems come from Ojai, a sleepy little town about an hour outside of LA. Twice I have had the pleasure of staying at the Ojai Valley Inn and Spa. It is a little slice of heaven. It is a place to be pampered and spoiled. When you check in you find a little bowl of these waiting for you in the room. They have a beautiful Sunday brunch. The town is a little artisan community with fun little shops and several great restaurants. It is a great way to spend a weekend. I made this salad for lunch last week. It is made with endive, radicchio, pixies and toasted pecans. I toasted a few slices from a baguette and topped with goat cheese and fresh herbs. I made a vinaigrette with white balsamic vinegar and olive oil. It was the best lunch. Sometimes the simplest things are the best. They are always best shared with a friend. Today invite someone over for a simple lunch and rich in conversation. Want More Pixie Tangerine Recipes? Mix together radicchio, endive, and tangerines. Toss with vinaigrette and sprinkle pecans on top. Serve with toasted french bread slices topped with goat cheese and chopped fresh herbs.